CADRE is currently supporting the following special interest groups: Algebra, ELL, Engineering, Gaming, Knowledge Use, New Measurement Paradigms, and Science Curriculum. Based on gatherings at the recent PI meeting, several other groups may form. Is there a group that hasn't yet formed and is of interest to you (and likely others)? Is there a short-term collaborative effort among the DR K-12 grantees that CADRE should support? If so, let us know by emailing CADRE@edc.org. Watch for future emails with the latest news from each of the currently active SIGs. On a regular basis, NSF seeks reviewers for DR K-12 proposal submissions. Review panels are typically held approximately 3-6 months after the proposal due date. If you are interested, please send your resume to Elizabeth VanderPutten with the subject line: DR K-12 Reviewers. You cannot review if you are listed as personnel on a DR K-12 proposal that has been submitted for review in response to a current solicitation. NSF chooses reviewers based on the content of the proposals they receive. Why Serve on an NSF Panel? Gain first-hand knowledge of merit review process. Learn about common problems with proposals. Discover strategies to write strong proposals. Meet colleagues, and NSF Program Officers managing the programs related to your research. Discuss the merits of the proposal with other panelists who reviewed the proposal. Make a panel recommendation to NSF on whether the proposal should be funded. Some panels may be supplemented with ad hoc reviewers if additional expertise is needed. Review and consider all proposal materials. Make independent written comments on the quality of the proposal content. Each proposal is reviewed by at least three individual peer reviewers. Contact the NSF Program Officer(s) of the program(s) that fit your expertise. Introduce yourself and your research experience. Tell them you want to become a reviewer for their program. Ask them when the next panel will be held. Send a 2-page CV with current contact information. Stay in touch if you don’t hear back right away. You may not become a reviewer if you are listed as personnel on a proposal currently submitted for review. Reviewer recommendations included in proposal or sent by email, i.e., proposers are invited to either suggest persons they believe are especially well qualified to review the proposal or identify persons they would prefer not review the proposal. NSF Program Officers make funding recommendations guided by the panel summary, program goals and portfolio considerations. 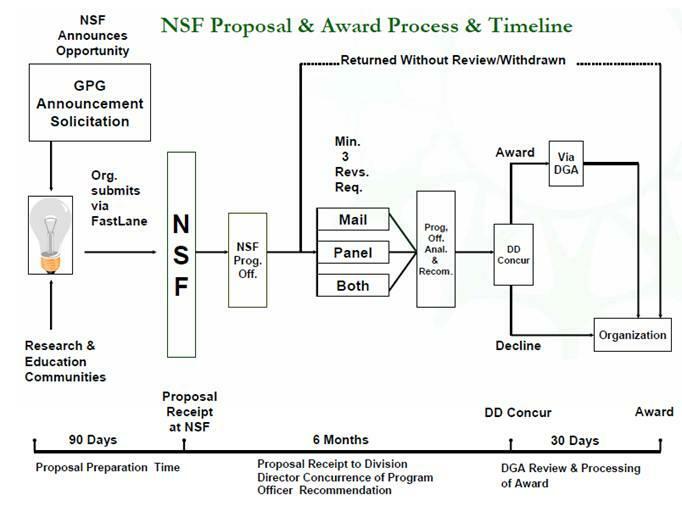 NSF Division Directors either concur or reject the program officer’s funding recommendations. The institution has an adequate grant management capacity. The PI does not have overdue annual or final reports. Here are a few descriptions of the panel review process. Please note that they are not specifically related to DR K-12, or limited to official NSF information. For your convenience, CADRE has updated the Indices of STEM Conferences and STEM Publications with the latest information on STEM education related conferences and publications, including up-to-date instructions for presentations and manuscript proposals. To investigate the contribution of the DR K-12 portfolio to the knowledge base on mathematics and science learning among ELLs, CADRE conducted a study exploring the ELL work being carried out in DR K-12 projects. The study examined the expertise of investigators working on DR K-12 ELL projects, the key characteristics of DR K-12 ELL projects, and how the DR K-12 portfolio compares with the work typical of the larger fields of ELL mathematics education and ELL science education. This work was prepared for CADRE's ELL Working Group and in response to hypotheses generated by the work group at the 2009 DR K-12 PI Meeting. Download a copy of the full paper, here. Produced by CADRE's Work Group on Partnerships with Districts and Schools for Knowledge Use, this brief makes a case for substantive partnerships between STEM education R&D projects and districts and schools. The brief summarizes what the authors have learned about creating and maintaining partnerships, as well as potential pitfalls and challenges. Along with practical strategies, the authors provided examples from project experience. Download a copy of the brief, here. Resource: Interested in Knowing More about DR K-12 Science Curriculum Projects? CADRE has developed a descriptive synthesis, which summarizes the DR K-12 science curriculum landscape, characterizes project research questions, and describes DR K-12 science projects' use of technology. Originally presented at a 2010 working meeting of CADRE's Science Curriculum SIG, these materials were prepared to support the SIG's efforts to explore the types of science curricula being developed in DR K-12 and the types of technologies employed. Learn more and download the synthesis materials, here. "By repudiating direct instruction and other 'classic' methods in the math classrooms, are we able to offer the best curriculum possible?" "Does the notion of learning progressions even make sense, or is there something else that would more accurately represent students' thinking/teachers' practice?" "Would an effort to market our products in the manner of commercial developers really amount to selling out?" Find Fellows' opinions on these questions and more, below. Many of the posters presented at the 2010 DR K-12 PI Meeting are available for "virtual" visits and discussions. Stop by! With the December PI meeting behind us, we are now planning some follow-up support for grantees who participated in special interest groups and job-alike groups. We are organizing activities for the CADRE Fellows who appreciated the opportunity to attend sessions and network with those of you who are experienced STEM researchers and developers. Their reflections are quite revealing and we hope you will read and respond to their blog entries. Visit cadrek12.org to view postings from the meetings including PowerPoints and a virtual poster gallery. If you still need to send us your materials electronically, it’s not too late! DR K-12 received over 500 proposals this round, and we know that many of you are serving as reviewers. We expect that the new awardees will expand the expertise within the portfolio. If this new group includes a large number of PIs and Co-PIs new to NSF funding, we will be looking to you for ways to support their entry into this complex environment. A major effort of CADRE’s outreach will be new and emergent leaders in STEM research and development. Additionally, as CADRE moves forward, we expect to disseminate the learnings and findings of your collective work, with the goal of “crossing the abyss” identified by Joan Ferrini-Mundy and Sue Allen in their plenary address at the PI meeting. Please feel free to contact us with ways to better support the DR K-12 community.